Hiring a contractor can be a challenge. Especially looking for one in a new neighborhood, new city, or for a project that you may be unfamiliar with. 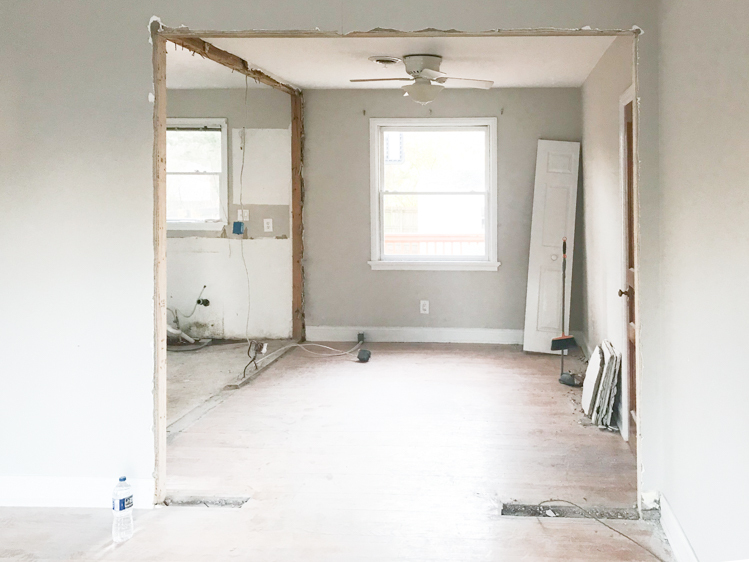 Over the past five months of renovation on Our Richmond Fixer Upper, I have learned a lot about how to find a good contractor, and wanted to share some of my top tips. I have been acting as the general contractor on our home renovation, which means that instead of hiring one construction company to manage all of the aspects of the job, I have done the hiring and management of each separate trade myself. I have hired companies to install and finish the floors, install the cabinets, complete framing, finish sheetrock, install plumbing, install tile, and haul away construction debris all separately. It has been a huge project, and luckily I really love the process. If you are unfamiliar with construction, uninterested in constant project management, and would rather have your larger construction handled by a seasoned pro, you will likely be looking to hire a general contractor. If you are hoping to be really involved, see yourself making all of the decisions, and are comfortable working with and managing people, you might consider doing the management yourself! It is really important at the outset of a construction project to determine and define the scope. House renovation projects can easily snowball from one thing into the next, and before you know it you have remodeled the entire house when you meant to update the bathroom. If you define clearly the scope of the project from the outset, you will be able to get clear pricing, communicate more easily, and make hard decisions as they arise without blurring lines too far into OTHER projects. Know that you may have to accomplish your project in stages, and get clear about what the start and stopping point for each stage will be, then don’t expect the contractor to do more than initially planned. Google is a great source for general pricing information. Sometimes I want to get a rough idea of a project cost before I begin even asking people to come bid it. For future planning purposes, try a simple search like “cost of a roof replacement” or “small kitchen renovation cost”. Although the numbers won’t be specific to your situation, and may very greatly, it is nice to know whether you should be thinking about $4000 or $40,000 as a realistic starting point for your project. Once you have a ballpark idea of pricing, you can have people give estimates and know whether they are way in left field, or if the numbers sit well with what you had imagined. In my experience, any project ends up costing 80% for the initial construction, and an additional 20% in finishing touches. There are always unexpected costs associated with construction, so it is a good idea to start with the idea that things will cost about 20% more than you initially plan on. Local realtors are great resources for contractors. Most have at least some experience helping customers do home improvements as they ready their home for the market, and some will also have extensive flip experience as well. Even if you don’t have a realtor that you have worked with on a home buy or sell in the area, you can reach out and ask for a construction referral. Most realtors will be happy to help, and form a relationship with you for future business possibilities. Our realtor has been indispensable in our own large renovation project. 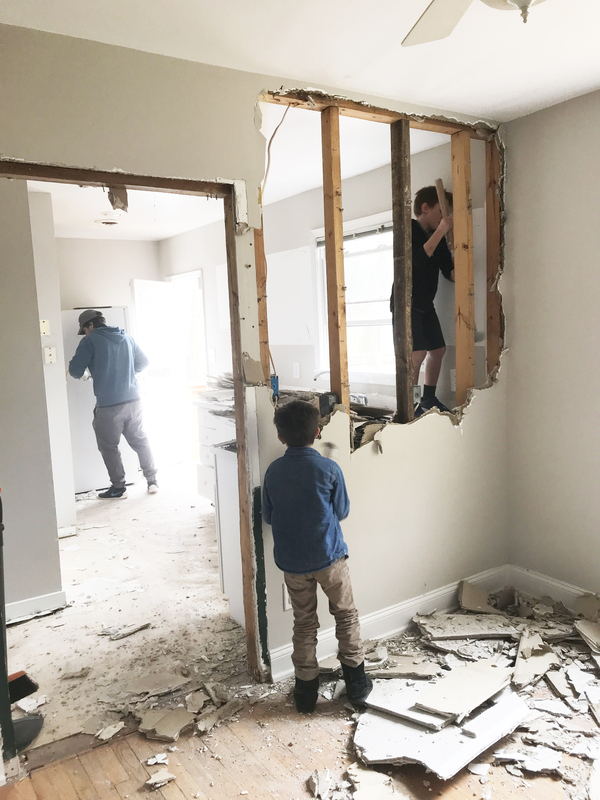 We brought in a couple contractors for ballpark pricing before we decided to buy the home, then we have called him for referrals for a structural engineer, carpenter, plumber, and sheetrock pro. In addition to asking your realtor for referrals, don’t forget to ask friends and neighbors. If you don’t have personal contacts in your area, community apps like NextDoor, and even Facebook can be great resources for asking for specific trade and contractor referrals. This isn’t as terrible as it sounds…I love hiring independent subcontractors that also work for big companies. When I hired a remodeling company to widen a load-bearing wall and install a header beam, they called in an electrician to move a light switch. I chatted with him as he worked and got his card to hire back. He ended up doing the electrical in my entire kitchen, and has been back every time I need something rewired or fixed. My deck carpenter was a referral from the team who helped me install my paver patio. I had mentioned I needed a deck rebuilt, and they sent me his number. He works full-time for a big construction company, but does small jobs independently on the weekends and he is now my right-hand man for carpentry work around the house. As long as you don’t step on the pros toes, using their subs on weekends and after work hours can be a great way to have a well seasoned worker. Once you have some phone numbers or websites, schedule people to come give estimates. It is standard practice within the construction industry for companies and contractors to give their bid for a project, and most do so for free. I like to have a minimum of 3 estimates to compare before I choose a contractor for any given project, and sometimes I have gotten 4 or 5 to be sure I am getting not only a fair price, but a great fit overall. The purpose of the estimation process is not only to get a price, but also to meet the contractor, ask questions, talk through the scope of the project, find out their timeline, and discuss what happens if there are problems. I take advantage of the estimation meetings to get to know the company and decide if I like them. Even before I get numbers back, I can usually determine which company I prefer to work with. What is your timeline for starting and finishing this project? Some contractors are super busy, and continue to take work. They may oversell themselves, and then show up sporadically once the contract is signed. I like to get a start and end date in writing before I hire a contractor for a project. When do you consider the job finished? Will they do the work and split? Or do they make sure the area is clean, and organized back to the way it was before they began? If they are finishing drywall, will it be painted? Paint-ready? If the tile is going in, will the grout also be sealed, or just applied? Do some research and ask how done is “done” for them. What type of work warranty do you offer? It is smart to ask about warranty before you hire someone to work on your house. What if they fix a leak and it starts leaking again the next week? Do they fix it again for free or is that considered another project? It is nice to avoid disappointment and missed expectations by being really clear before you begin. What about change-orders? Sometimes unexpected things arise in middle of a project. It is really important to be very clear about the cost of the unexpected changes, because this is one place where predatory contractors can really gouge you. Once a wall is open, you want to get it closed and finished, so it can be easy to be vulnerable and agree to whatever pricing they ask. Or even sometimes people forget to ask about price, and are super surprised when that extra 1 foot of tile backsplash cost more than the other 10 feet. Avoid headache by asking about price, getting the change in writing, and moving forward from there. The cost of the project and quality of work are not the only important factors in hiring a contractor. You also want them to be a good personality fit! I have hired a wonderful, inexpensive carpenter who did amazing work but worked so slowly it nearly drove me bonkers! He was way to chill for my high energy personality and in the end I decided to let him go mid-project because it was so hard emotionally to have him miss deadlines and not show up on time. A higher energy personality person, like me, needs a go-getter contractor who will be there, do the work, and clean up. A lower energy or less decisive personality may have a hard time with a quick-moving contractor and feel overwhelmed needing to make fast decisions. Personality fit is something that can really only be determined by meeting in person, so this is something I try to evaluate during the estimation process. When you embark on a construction project, you likely have an idea of how you would like it to end. Be clear about those expectations with the contractor from the get-go. The more they know, the better able they are to meet your expectations. Know that some things will cost more, and be prepared to be realistic about what fits within your budget, and the scope of the project. It is a good idea to determine your priority list, as sometimes not every expectation can be met exactly and the contractor has to make some on the spot decisions. For example, if it matters more to you that the sink be centered even if it means the cabinet door doesn’t open quite as wide, make that priority clear. In my experience, most trouble with contractors arises from miscommunication and missed expectations. When these things are super clear from the get-go, it is a lot less likely you will run into issues. Once you have vetted some contractors, loved their work, and found your favorites, be generous with recommending them to friends and family. You can save people a lot of the trouble you went through to find some great teams. Of course, your contractors might not be a perfect fit for everyone, but sharing your positive experiences will help them continue to have great work and thrive. I hope with these tips you will have a better idea of how to find a good contractor for your house projects. There are some out there, I promise! It does take a little work and a lot of questions to find the best one for you!